Summer temperatures have reached their peak and it doesn’t look like they will be cooling down any time soon. We’ve created a list of important information and helpful tips to guide you through the summer heat. Stay hydrated – Drink plenty of water and avoid alcoholic and caffeinated drinks. Watch for symptoms – The National Weather Service has a helpful infographic that explains the differences between heat exhaustion and heat strokes. Some symptoms, like nausea or vomiting, are signs of both. Other symptoms are much different. For example, when you experience heat exhaustion you may have excessive sweating and cool, pale, and clammy skin. When you experience a heat stroke you experience the opposite. You may have a fever with red, hot skin and no sweating. The American Red Cross recommends calling 9-1-1 if you or someone you know is showing sign of a heat stroke. You can see the full graphic with more information from the NWS here. Learn more about what to do during a heat stroke or heat exhaustion from the Red Cross here. Stay cool when you can – Turn on your AC at home or spend as much time as you can in air conditioned places to help avoid excessive heat. If you use fans to keep cool, do not direct the flow of the fan directly toward yourself if the room is hotter than 90°F. According to the NSW, the dry blowing air will cause dehydration at a quicker rate and can endanger your health. Cool baths and showers can also help alleviate the discomfort from excessive heat. Remember that hot cars can be deadly – Never leave children or pets in your car. A closed vehicle can reach 140°F-190°F degrees within 30 minutes on a hot, sunny day. According to a report from San Jose State University, there were 24 child vehicular heat stroke deaths in 2015. There have already been 23 reported this year. According to the report, 54% of these deaths over the last 18 years have been caused by the child being “forgotten” by the caregiver. You can learn more here. Be aware of the air quality index – About News reports that the air quality can decrease during the summer months since the heat and sunlight, “essentially cook the air along with the chemical compounds.” Poor air quality can make breathing difficult for those with respiratory or heart problems. You can visit AirNow.gov to check your local air quality conditions. The website will breakdown the air quality forecast, current conditions, and nearby resources for more information. Excessive Heat Warning – This is issued within 12 hours of the onset of extremely dangerous heat conditions. The criteria for this warning may vary across the country, but the general rule explained by the NWSFO is, a warning is issued when the maximum heat index temperature is expected to be 105°F or higher for at least two days where night time air will not drop below 75°F. Excessive Heat Watches – A heat watch is issued when conditions are favorable for excessive heat within the next 24 to 72 hours. A watch means the risk of a heat wave has increased but the time of its occurrence is unknown. Heat Advisory – Like the excessive heat warning, a heat advisory is issued within 12 hours of the onset of extremely dangerous heat conditions. The criteria for this warning may vary across the country, but the general rule explained by the NWSFO is, a warning is issued when the maximum heat index temperature is expected to be 100°F or higher for at least two days where night time air will not drop below 75°F. Excessive Heat Outlooks – An excessive heat outlook will be issued when there is potential for excessive heat within 3-7 days of the alert. 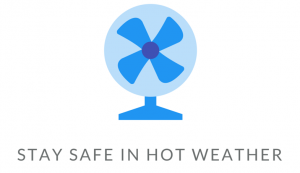 Stay safe and stay cool this summer – No outdoor adventure or activity is worth risking your health and well-being during these hot, summer months.